In response to a Lufthansa specification of 1933 for a six-passenger mailplane, Dornier designed a shoulderwing all-metal monoplane to be powered by two 660-hp (492-kW) BMW VI engines. Three prototypes of this Dornier Do 17 were built in 1934, but although the airline carried out an evaluation programme early in the following year, the aircraft's slim fuselage provided such limited passenger accommodation that all three were returned to the manufacturer. The design had military potential, however, and a fourth prototype (Do 17 V4) with twin vertical tail surfaces and a shortened fuselage was flown in the summer of 1935. Among development prototypes, the fifth was powered by 860-hp (641-kW) Hispano Suiza 12Ybrs engines, the seventh mounted a 7.92-mm (0.31-in) MG 15 machinegun in a dorsal blister, and the tenth was fitted with 750-hp (559-kW) BMWVI engines. The initial production versions were the Do 17E-1 which, developed from the ninth prototype, had a glazed and shortened nose, and carried a l,102-lb (500-kg) bombload, and the Do 17F-1 reconnaissance aircraft with increased fuel capacity and two cameras. Both of these models made their operational debut with the Legion Condor in Spain during 1937. Their performance was such that they had little difficulty in avoiding contact with the obsolescent aircraft then serving with the Republican air force. Introduced publicly at the 1937 International Military Aircraft Competition held at Dubendorf, near Zurich, the Do 17 V8 prototype (or Do 17M V1) powered by two l,000-hp (746-kW) Daimler-Benz DB 600A engines soon gained the nickname 'Flying Pencil' because of its slender fuselage. More significantly, it was able to better the performance of international fighters taking part in the contest. 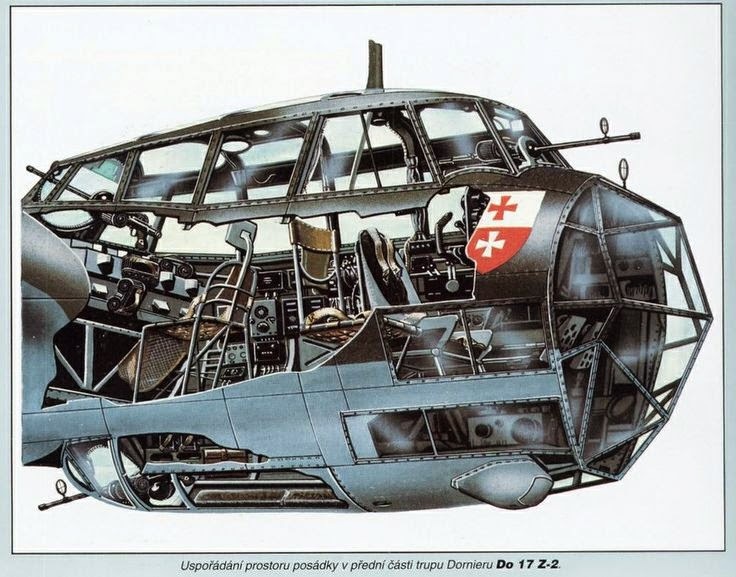 Following this demonstration at Dübendorf, Yugoslavia showed interest in the type and the Do 17K was developed for that nation, being similar to the Do 17M but powered by two 980-hp (731-kW) Gnome-Rhone 14N1/2 engines. The type was to be licence-built by Drazavna Fabrika Aviona at Kraljevo, the three versions, produced being the Do 17Kb-1 bomber, and the Do 17Ka-2 and Do 17Ka-3 reconnaissance aircraft with secondary bombing and attack capability respectively. Two prototypes of a proposed pathfinder version which did not enter production were built under the designation Do 17L, these being powered by two 900-hp (671-kW) Bramo 323A-1 radial engines because of a shortage of Daimler Benz DB 600s. The same Bramo powerplant was used for the thirteenth and fourteenth prototypes to develop the airframe/engine combination for the production Do 17M-1, which could carry a 2,205-lb (l000-kg) bombload and was armed with three 7.92-mm (0.31-in) MG machine-guns. A photo-reconnaissance version of the Do 17M entered production under the designation Do 17P, powered by two 875-hp (652-kW) BMW 132N radial engines and carried Rb20/30 and Rb50/30, or Rb 20/8 and Rb50/8 cameras in the Do 17P-1 production series. Two aircraft were built as engine test-beds under the designation Do 17R, one with 950-hp (708-kW) Daimler-Benz DB600Gs, and the other with l, 000-hp (746-kW) Daimler-Benz DB 601As. They were followed by three DB600G-powered high-speed reconnaissance aircraft which had the designation Do 17S-0. Used for test purposes, these had an extensively glazed nose and the airframe incorporated a bulged section in the underside of the forward fuselage, accommodating a gunner in a prone position to operate an aft-firing MG 15 machine-gun. These experimental reconnaissance machines were followed by a small production batch of 15 pathfinders, comprising three Do 17U-0 and 12 Do 17U-1 aircraft, the five-men crews of which included two radio operators to handle the new and comprehensive communications and navigation radios. Major production version was the Do 17Z, which appeared in several variants and was built to a total of some 1,700 between 1939-40. They included the Do 17Z-0 which, powered by two 900-hp (671-kW) Bramo 323A-1 engines and armed with three MG 15 machineguns, was otherwise similar to the Do 17S. The Do 17Z-1 had an additional nose-mounted MG 15 but was underpowered and restricted to a 1, 102-lb (500-kg) bombload; this situation was rectified in the Do 17Z-2 which with 1,000-hp (746-kW) Bramo 323P engines could carry a 2,205-lb (1000 kg) bombload and up to eight MG 15 machine guns. Some 22 examples of the Do 17Z-3 reconnaissance aircraft were built, each equipped with Rb50/30 or Rb20/30 cameras, and they were followed by the Do 17Z-4 dual-control conversion trainer. Final bomber variant was the Do 17Z-5 which, generally similar to the Do 17Z-2, differed by having flotation bags in the fuselage and in the rear of the engine nacelles. Do 17 production ended with a single Do 17Z-6 Kauz I (screech owl I) long-range intruder and night-fighter which incorporated a Junkers Ju 88C-2 nose housing a 20-mm MG FF cannon and three MG 15 machine-guns. However, for the nine Do 17Z-10 Kauz II aircraft that followed a new nose was developed which housed four MG FF cannon and four 7.92-mm (0.31-in) MG 17 machine guns; when deployed as nightfighters they were equipped with Lichtenstein Cl radar and Spanner-II-Anlage infra-red detection apparatus. 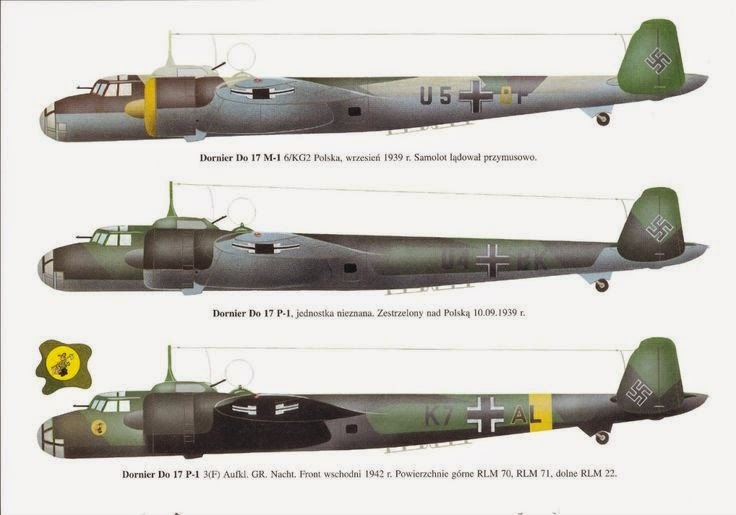 Export versions of the Do 17Z were planned under the general designation Do 215, the first to be developed being the Do 215A-1, with l, 075-hp (802-kW) Daimler Benz DB 601A engines, which was ordered by Sweden in 1939. 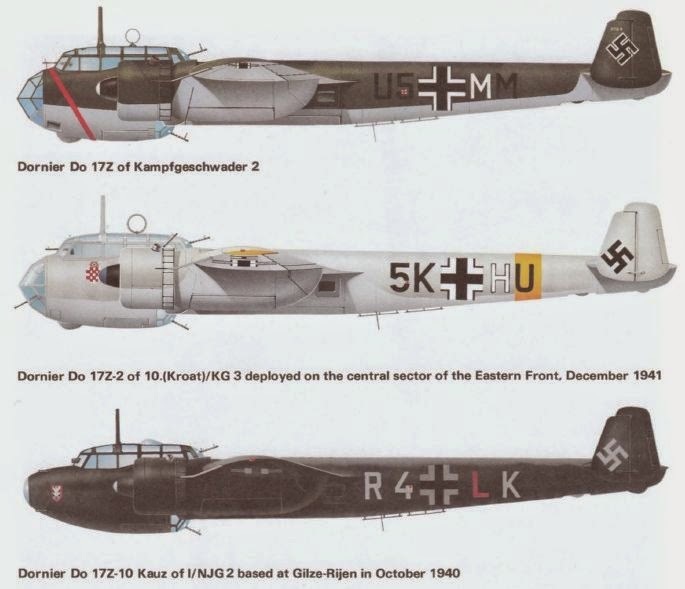 With the outbreak of World War II the 18 aircraft were embargoed and following conversion to Luftwaffe requirements were delivered for use as four-seat bomber/reconnaissance aircraft under the designations Do 215B-0 and Do 215B-l. Two examples of the Do 215B-3 were delivered to the USSR during 1940, and the Do 215B-4 was a reconnaissance version, similar in configuration to the Do 215B-1, but carrying Rb 20/30 and Rb 50/30 cameras. Final variant was the night-fighter/intruder Do 215B-5 which had an unglazed nose, similar to that of the Do 17Z-10, but housing two 20-mm MG FF cannon and four 7.92-mm (0.31-in) MG machine-guns. Dornier Do 17s played a significant role in the early phase of World War 11, used first on 1 September 1939 when the invasion of Poland began. They played only a small part in the Norwegian campaign, but were used extensively in the invasion of France and the Low Countries, against Allied convoys in the English Channel and targets in England during the Battle of Britain. Deployed in the invasion of Greece, Yugoslavia and the Soviet Union, most had been withdrawn from first-line service by late 1941.